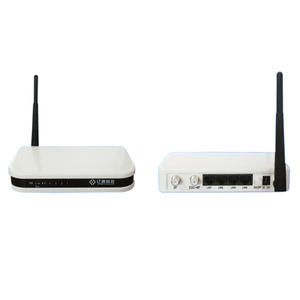 YTHCW-51N4-1 EOC Slave Wifi Introduction: YTHCW1N4 Series Slave Modem Wifi utilizes Homeplug AV technology and is used to connect all so r ts of devices, such as PC, routers, etc. It modulates and demodulates user's data so that it could be transmitted over coaxial netwo r k. Supports Port VLAN grouping, priority control of IEEE 802.1P Supports Port Rate Self-adaptation, and Polarity Self-adaptation. YTHCW-51N4-1 EOC Slave Wifi Introduction: YTHCW1N4 Series Slave Modem Wifi utilizes Homeplug AV technology and is used to connect all so r ts of devices, such as PC, routers, etc. It modulates and demodulates user&rsquo;s data so that it could be transmitted over coaxial netwo r k. Supports Port VLAN grouping, priority control of IEEE 802.1P Supports Port Rate Self-adaptation, and Polarity Self-adaptation. It&rsquo;s has 4 10/100M full duplex Ethernet ports which can simultaneously connect computer, Set Top Box(STB) or other terminals. MSS5004W occupies low frequency band under 65MHz and has no collision with the current CATV system frequency which can decrease mutual interference. 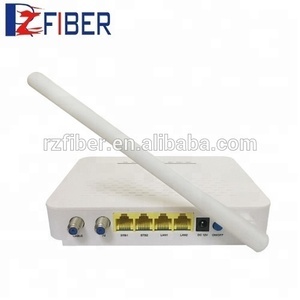 It&rsquo;s based on 802.11n standard, compatible with 802.11b/g, providing up to 300M wireless transmission for home network coverage. Not need to restructure existing HFC network and provide physical-layer band with of 700Mbps and Mac layer band with of 320Mbps to supports broad band with service . Provides 4-RJ45 Ethernet ports and built-in 802.11b/g/n wireless function to satisfy needs in different application environments, Supports TR069 protocol. Supports QoS configuration functions to provides differentiated quantity assurance for services of different categories. EOC-S402W is the EOC slave based on HomePlug AV solution for Ethernet access over coax. The 7.5-65MHz low frequency band is used for EOC signals. The 7.5~65Mhz low frequency band is used for EOC signals . We can print your logo on the cable jacket, labes and carton box. Our Company IH Optics, is located in shenzhen closed to HK. Our main products are patch cords, especially for outdoor patch cords. It&rsquo;s has 4 10/100M full duplex Ethernet ports which can simultaneously connect computer, Set Top Box(STB) or other terminals. MS S500 4 W support bandwith control and encrypted transmission to satisfy high reliable service. The m aximum u plink bandwidth can be configured individually in order to prevent the attack to the whole coaxial t ransmi ssion network . hot selling 7.5 65Mhz EOC master EOC Slave wifi EOC slave wifi is the EOC slave based on HomePlug AV solution for Ethernet access over coax. EOC slave with wifi is slave with 4 Ethernet ports with built-in Wifi. The EOC slave without the wifi,can not support the router functions. Alibaba.com offers 474 eoc slave wifi products. About 85% of these are fiber optic equipment, 11% are other telecommunications products, and 2% are radio & tv broadcasting equipment. A wide variety of eoc slave wifi options are available to you, such as free samples. There are 474 eoc slave wifi suppliers, mainly located in Asia. The top supplying country is China (Mainland), which supply 100% of eoc slave wifi respectively. Eoc slave wifi products are most popular in Southeast Asia, South America, and Domestic Market. You can ensure product safety by selecting from certified suppliers, including 218 with ISO9001, 117 with ISO14001, and 24 with Other certification.